Astraweb is a Usenet back-end provider that became very popular in last 16 years in business. The company provides classical NNTP access - after payment user gets access details to the server. Thousands of Usenet fans love this provider because of it’s high quality of Usenet experience for good price. Today, Astraweb is the main competitor of Giganews on the market. Both run own server infrastructure. The retention of Astraweb can be compared to Giganews and is limited to 2061 days for every single newsgroup. Because of high number of peers, the provider is able to provide 99% file completion. Astraweb offers excellent propagation of posts with many peers that leads to faster downloading of binary files from Usenet. 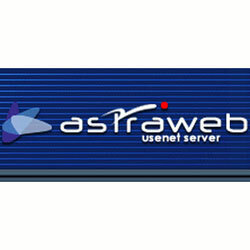 Astraweb runs own server farms located in Europe and United States, the company doesn’t resell Usenet access from others. The amount of servers is lower as at Giganews, but it doesn’t make much different while the communication between a computer of a user and a Usenet server. The connection will be handled without timeouts or maintenance outages. Astraweb offers unlimited download speed for own customers. The provider offers just 20 simultaneous connections and not 50 as Giganews does. This leads to slower download speed, but you will get 10 to 20 Mbit without any problems - I don’t think that you would need more bandwidth with your ISP. Astraweb offers qualified Usenet access for very good price! You have a choise between unlimited and limited by download volume plans. If you download much then you can take unlimited package for $ 15/mo or for $ 10/mo with speed limitation up to 10 Mbit/s. There are also limited accounts available: for a block of 25 GB you will have to pay $ 10, for 180 GB $ 25 and for 1.000 GB $ 50. All payments are not recurring and need to be renewed manually. I call this art of payment policy as very customer friendly, because many customers at other providers will be rebilled automatically without a wish to renew. Astraweb doesn’t offer any own useful tools that can be used by customers. So there will be a Usenet newsreader required that has to be configured with paid server NNTP access on Astraweb. The user panel is very simple done, without much information on how to start. With Astraweb you will get your connection 256-Bit SSL encrypted. This will protect your privacy and download details from your Internet Service Provider. Astraweb is powerful Usenet service that I would advice experienced users. If you are new to Usenet and never worked with a Newsreader, then it will take much time to configure it. With Astraweb you will get fast NNTP access to Usenet network for a good price. The website is simple done, the admin panel doesn’t store much information about how to start, no any own tool will be offered - it’s pure Usenet access! From the point of view of Usenet quality, Astraweb is for me on the second place after Giganews.